Christopher Lloyd began his musical career at the age of 15 when he joined the Army as a trainee bandsman with the South Wales Borderers receiving instruction on the flute. After three years' initial training he went on to study flute, bass guitar, conducting, composition and arranging at The Royal Military School of Music before returning to his regiment and embarking on a life of musical travel, visiting Europe and Hong Kong. In 1970 he joined The Royal Artillery Band where he was principal flute for seven years. During that time he was approached by the Inner London Education Authority to teach flute and conduct ensembles in a number of local London schools. After leaving the Army in 1983 Chris continued with his work in the schools and in 1984 took over as Musical Director of the Greenwich Youth Band which had been formed just two years earlier by a fellow ex-Royal Artillery musician. With the formation of the Greenwich Concert Band in 1988 Chris took on the role of Musical Director for both the senior and youth bands. He still teaches in local schools but now concentrates on giving private tuition, coaching at holiday music courses and playing in local orchestras. 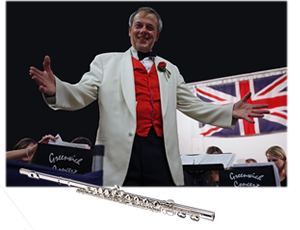 Chris is also a member of the Militaire Orchestra, performing at venues such as Mansion House and Guildhall in the City of London and the Old Royal Naval College, Greenwich. In March 2014 Chris Lloyd was honoured by The Royal Borough of Greenwich with a 'Lifetime Achievement Award for Services to Music' - an award richly deserved.